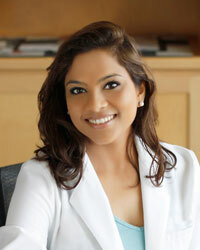 Dr. Nidhi Jain joined Capitol Periodontal Group in 2012. She is board certified by the American Board of Periodontology. With over 10 years of periodontal experience, she brings extensive expertise in the diagnosis and treatment of periodontal disease, dental implants, bone grafting, laser therapy and the optimization of overall oral health to all the patients she treats. Dr. Jain earned her Bachelor of Dental Surgery (BDS) degree in 2003. She then graduated at the top of her class at Tufts University, earning her Doctor of Dental Medicine (DMD). Upon earning her DMD she attended The Ohio State University college of Dentistry, where she earned a Master of Science (MS) in Oral Biology with a Certificate in periodontology and IV Sedation. During her time at Ohio State she was appointed Chief Resident and served as an adjunct Clinical Assistant Professor. Dr. Jain is a proud member of the American and California Dental Associations, and the American and California Associations of Periodontology. In addition, Dr. Jain volunteers her time to CDA's Cares and the Sacramento District Dental Society (SDDS). In her free time, she enjoys staying healthy by working out, cooking, traveling and spending quality time with friends and family. Dr. Jain is looking forward to meeting and working with each of you, utilizing her experience and leading-edge education in all aspects of periodontal care.